A trip to Taipei isn’t complete until you’ve had mango shaved ice! There is also no question about getting shaved ice when it’s hot, humid, and rainy. Just go and get it! We got the Fresh Mango Sensation (新鮮芒果綿花甜) for NT$220. Fresh mango pieces with mango puree, mango ice cream, shaved ice with mango syrup, and tofu on the side. In other words, it was mango heaven for mango lovers!!! The shaved ice is more or less called “shaved snow” in the United States. The ice isn’t crunchy like crushed ice cubes but a melt-in-your-mouth variation. If you’re not a mango lover, Ice Monster has other flavors and other style of shaved ice as well. 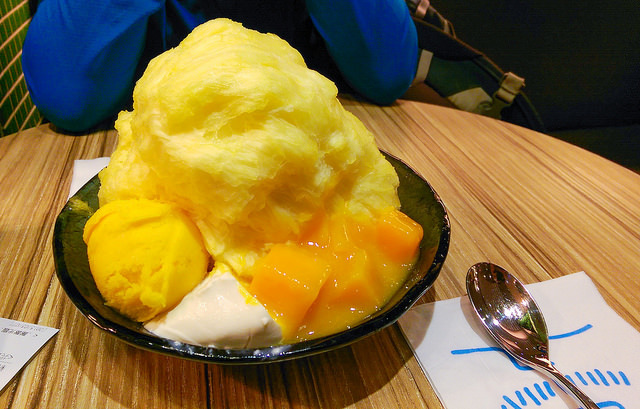 The famed Ice Monster is known around the world for their signature mango shaved ice, earning a spot in almost any guidebook on Taiwan, and even a mention in the New York Times. On any given day, throngs of loyal fans would line up for these delicious shaved ice creations, with Ice Monster serving sometimes up to 10,000 desserts per day. [In 2010], Mr. Lo finally broke his silence in a press release issued by his attorneys, explaining the reasons behind the sudden closure and refuting the allegations by his ex-wife’s family. Mr. Lo cited insolvency as the primary reason behind the sudden decision to close up in the morning hours of January 15th. He claimed that property liens and the requirment to pay half of the net proceeds to his ex-wife left him unable to cover daily operating expenses. In business since 1995, Ice Monster was located on the popular Yongkang Street in Taipei, near other famous restaurants such as Din Tai Fung, Kao-chi, and Tu Hsaio Yueh – all restaurants that have played an important role in Taiwan’s history. Ice Monster offered a variety of delicious Taiwan shaved ice desserts, which consisted of large bowls of finely shaved ice, served with a variety of toppings and condensed milk to add that final sweet touch. Some of the most popular offerings included the fresh mango (when in season), the mixed fruit consisting of kiwi, mango (canned), and strawberry chunks, topped with mango ice cream and kiwi sorbet, and the rock mochi. The word ‘shaved ice’ in Chinese is 刨冰 (bao-bing in Mandarin) and 剉冰 (cua-bing in Taiwanese). The traditional variation is shaved ice with red bean and grass jelly. However, the most popular kind in Taiwan is with fresh mango. Even Uniqlo has a Taipei Omiyage T-shirt with mango shaved ice! At Ice Monster, a majority of the customers ordered some sort of mango shaved ice. We spotted a table with a group of maybe ten, with a Fresh Mango Sensation for each person!